Spc. Eric Richardson Beaverton, Ore., left, who was wounded in Kandahar, Afghanistan, bows his head in prayer before President Barack Obama addressed military personnel who recently returned from Afghanistan, Friday, May 6, 2011, at Fort Campbell, Ky.
Monday is Memorial Day and it’s a special holiday in America because it commemorates U.S. men and women who died during their military service. You might be to young to recall, but in 1968, with new bodies returning from a deeply unpopular war, Congress passed the Uniform Holidays Act, moving Memorial Day, Veteran’s Day and Washington’s Birthday to Mondays, to allow for convenient three-day weekends. The loss of focus on this once-somber day had become institutionalized. The change in the holiday was contemporaneous with a larger change in attitude among many Americans toward their government, its wars and those sent to fight them. Young men such as my father or my cousin Mike sat in Vietnam and read letters implying they were pawns in an immoral game, with nefarious intent to terrify kids in a jungle thousands of miles from home. Their dead were not to be honored upon their return, but rather shunned as emblems of a country in crisis… as people celebrated the beginning of summer rather than Memorial Day, one could debate that a generation grew up not understanding what the day’s name really meant. My cousin was “KIA”, and recently a good buddy of mine had a family member, Spc. Eric Richardson from Beaverton, OR. 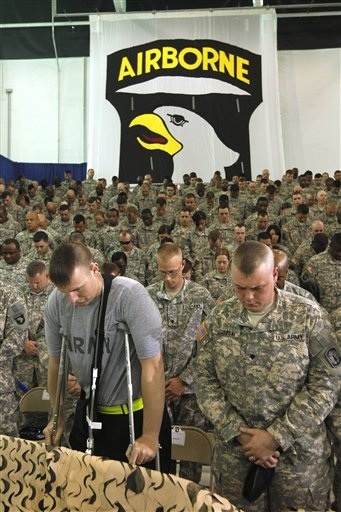 , who fought in Afghanistan come home wounded, but alive. He was shot in both legs in Kandahar, Afghanistan. Earlier this month at Fort Campbell, KY., he was selected to sit in the front line as one of the most recently wounded veterans when President Barack Obama addressed military personnel who returned from Afghanistan. He could barely stand and almost passed out from pain before he was finally able to sit down. It was a proud moment for his family. Sure, we’re all looking forward to an enjoyable Memorial Day barbecue and get-together, but regardless of one’s politics, independent of class, race or religion, there should be a basic acknowledgement and respect for those who have given their lives protecting an ideal. I’m grateful for all those who currently serve, have served, and those who have lost their lives defending our freedom. I hope that amidst the fun and sun rain, we might all perform some simple act of respect and honor all our brave service members. Photo courtesy of (AP Photo/Charles Dharapak).